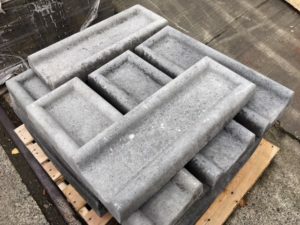 Concrete Splash Blocks | Salmon Bay Sand & Gravel Co.
Splash blocks provide foundation protection by diverting water that flows out of downspouts away from a house’s foundation. These handmade natural concrete blocks are steel reinforced and are built to withstand the test of time. Dimensions are: 11 inches Wide by 30 inches Long. Each Splash Block weighs in at 75 lbs…..so they aren’t going anywhere after you set them down! Call Salmon Bay to place your order or pick one up at our store!